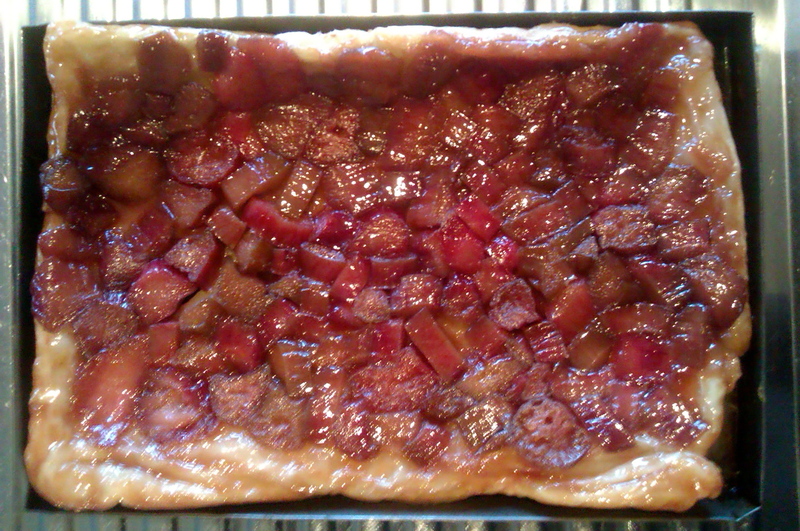 Rhubarb and cinnamon tarte tatin. We had some friends coming for dinner last week and I realised at about 4 o’clock that afternoon that I hadn’t thought of dessert! I quickly checked my fridge and freezer for ingredients (conveniently I had some rhubarb and store-bought puff pastry in the freezer) and then turned to one of my Donna Hay magazines for inspiration. Now, ‘rhubarb and cinnamon’ may not be a typical topping for Tarte Tatin, but trust me, it was truly delicious and something I will definitely be making again! The tartness of the rhubarb was perfectly balanced by the caramel and the subtle hint of cinnamon just added that extra bit of interest. Now that I know how deceivingly simply Tarte Tatin is to make, I will experimenting with lots of different toppings! Preheat oven to 190 deg C. Using a rolling pin, roll the pastry out on a lightly floured surface to 5mm thick. Cut out a 22cm x 32cm rectangle from the pastry and set aside. Place the sugar and water in a small non-stick frying pan over low heat and cook, stirring, until the sugar is dissolved. Increase heat to medium and bring to the boil. Cook for 7-9 minutes or until light golden. Add the butter and cinnamon and stir until the butter is melted and well combined. Pour the caramel into a lightly greased 20cm x 30cm baking tray and arrange the rhubarb pieces in the caramel. Top with the pastry and fold the edges under to tuck in the rhubarb. Make 3 small cuts in the pastry. Place on a larger baking ray and bake for 30-35 mins or until the pastry is puffed and golden. Allow to stand 2-3 mins. Loosen the edges with a knife. Carefully turn out the tarte to serve. Serves 4.